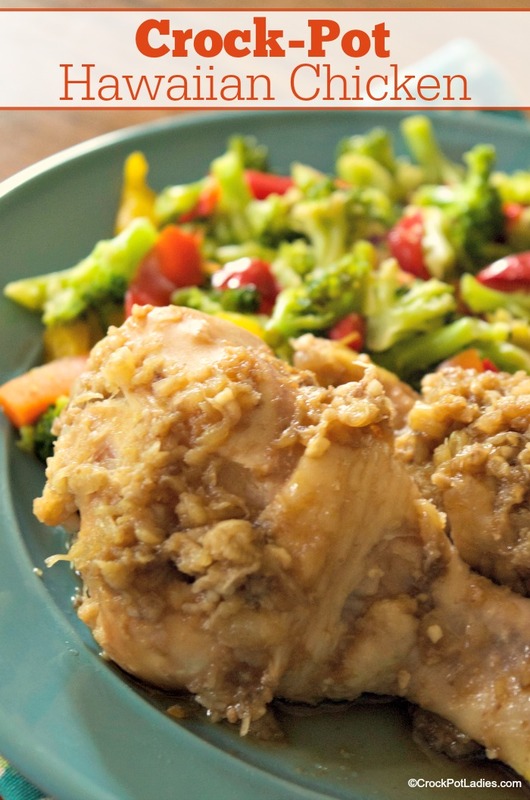 This recipe for Crock-Pot Hawaiian Chicken is a super easy and kid friendly way to prepare the ever so frugal favorite – chicken drumsticks (aka chicken legs). You can toss this together in no time and have dinner on the table without heating up the house baking chicken. I like to serve this with some quick stir-fried veggies and some steamed rice (white or brown, your choice). The extra sauce is yummy drizzled over both! Don’t let the picture fool you (I’m not a professional food photographer) this is a delicious dish! 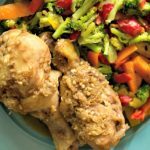 To make this recipe you just throw some canned crushed pineapple, soy sauce, ginger, and garlic in the slow cooker with your chicken drumsticks (you can use other cuts of chicken too – I think thighs would be super tasty!). Let that all cook for 4 hours until the chicken is cooked through. Then pour off the liquid and thicken it up with some corn starch on the stove top. We served this with some steamed rice and a bag of steamable frozen veggies. The sauce from the chicken drizzled all over everything is amazing! This easy recipe brings great flavors of pineapple, soy sauce, garlic and ginger to any cut of chicken. Dark meat chicken like drumsticks or thighs work great, but you can also use white meat chicken breasts too! In a bowl mix together the crushed pineapple (with the juice), soy sauce, ground ginger and garlic. 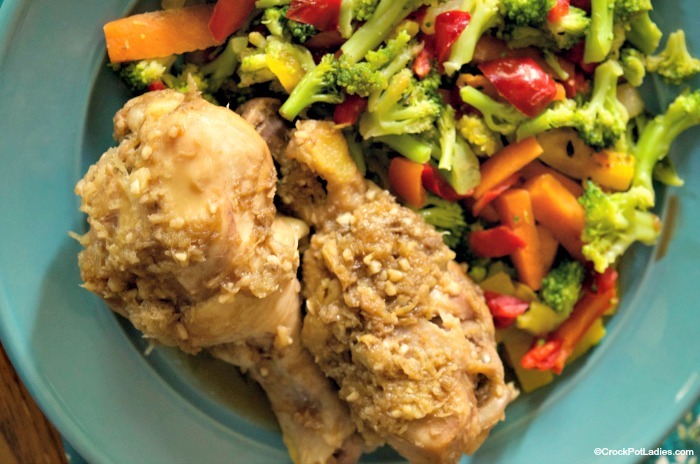 Place chicken drumsticks in the bottom of a 6-quart or larger slow cooker. Cover and cook on LOW for 4 hours or until chicken is cooked through. To make a nice glazed sauce to pour over the chicken remove the chicken from the slow cooker and pour out the sauce from the crock into a small saucepan. Heat juices on the stove on medium high until they come to a boil. In the meantime mix 2 tablespoons cornstarch with 1/4 cup cold water until there are no lumps. 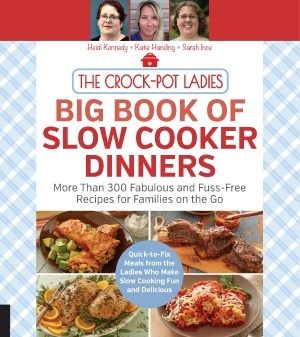 Pour cornstarch slurry into into boiling slow cooker juices and whisk while cooking until thickened about 2-3 minutes. Serve chicken and sauce over rice and steamed veggies if desired. I do not recommend cooking this dish in the crock-pot on high. Chicken tends to dry out when overcooked in the slow cooker. The sauce/glaze is totally optional the chicken is good without it. But even BETTER with it! This sounds delicious! I definitely have to try this one. Sounds delicious! Can you do this with chicken breasts or thighs? Fresh or frozen? You sure can Elpida, you can do this with chicken thighs & breasts either fresh or frozen. If using frozen just add an extra hour cook time. I’m cooking this tonight, can’t wait !, sounds delicious! Hope you and your family enjoys it Kim! I made this last night for my wife and me. I substituted boneless pork chops, and the pineapple cans at our store do not have a 15oz variety, so I used 20 oz instead. This turned out great. The 20oz cans of pineapple make for more delicious sauce. Whole family loved it! I didn’t thicken the sauce, but will next time. Still great as the rice absorbs much of the juice. So glad you enjoyed it Danielle!